As a preteen to young teenager (about ages 11-14), I went through an intense mountain biking phase. I biked nearly every day, having fun pushing myself to get better and better. I got into racing for a while, which resulted in several medals that are still hanging somewhere in my old room at my parents house. As a kid, I was fearless. I’d fly down hills, maneuver my way over rocks without a second thought. I was on my way to becoming a really good mountain biker. Then, for whatever reason, I just stopped. I don’t remember exactly why. It was probably just me being an angsty, confused teen, wanting to fit in with the typical girls my age. The bikes were put away, and I moved on to other things. In the years between then and now, I picked up a mountain bike only a handful of times. I was just always doing something else—kayaking, hiking, running, etc. It was the fatbike that brought me back. I was intrigued by pictures I had seen of the ridiculous-looking, cartoonish bikes with huge, knobby tires that would probably look more appropriate on a motorcycle or dirtbike. So, one night at a party, I happened to ask the man responsible for much of my exposure to the concept of the fatbike—local mountain biking guru Evan Gross—if I could give one a shot sometime. He was ever-enthusiastic, always happy to get more people on bikes. However, I wasn’t sure if the enthusiasm would last past that evening. It turned out that my doubts were unfounded. The next day, I got a message from him, asking me if I was serious about wanting to ride, and telling me that I was welcome to come along with him anytime. A year ago, I never would have taken him up on the offer. I would have been too scared, knowing I’d never be able to keep up. I, after all, hadn’t done anything that resembled serious mountain biking in nearly 10 years. But somehow, I found myself saying yes. I decided to just go for it. I’d never get out and do it if I didn’t just get out and do it. I’d never get better if I never tried. And besides, I was the one who had asked. I couldn’t back out now. So, after a few more message exchanges, Evan and I made plans to ride on chilly Thursday morning in early February. I was a little nervous as I drove out to Coopers Gap, our location of choice, but I just kept telling myself that it would be fine. I pulled into the parking spot, where Evan was already waiting. He handed me a bike, which I got on and immediately almost fell off of. The feeling of 4.8-inch tires is a bit different than a normal mountain bike. I laughed at myself, but I was really thinking, “Great, I feel like an idiot already.” I shrugged it off, got back on the bike, and off we went. It took me a while to even begin feeling remotely comfortable on the bike, but I was enjoying myself. By about an hour in, I was exhausted. My legs were tired, my arms hurt, and there was nothing more that I wanted than a drink of water…which I had failed to bring. But my only choice was to keep going. I refused to ask if we could stop, refused to admit how tired I was. I knew if I did that, I’d be letting myself down. So I continued slowly pedaling along, panting, red, and sweaty, sometimes a mile behind. 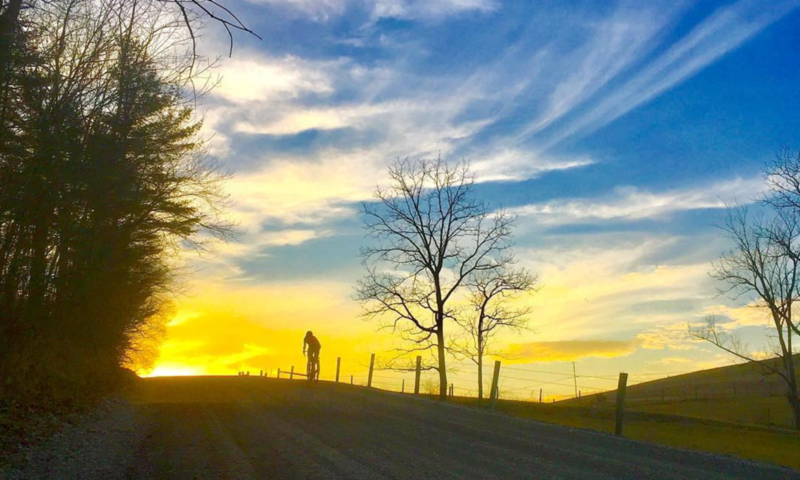 Every time he’d wait for me to catch up, I’d sheepishly look up and apologize profusely for how slow I was, and he’d keep telling me, “It’s not a race.” I’d laugh a little, but deep inside, I knew he was just trying to be nice, and figured he was probably just thinking that all he needed to do was get through this ride and then he’d never have to put up with this again. We finally finished the ride, we parted ways, and I spent the rest of the day feeling nauseous from pure exhaustion. But, I was also happy and proud of myself, and I found myself wanting to go out and do it again. So when Evan surprisingly invited me along on another ride, I once again said yes. That second ride was characterized by pedals that iced up after several stream crossings and some freezing-rain-like precipitation, and boots that kept sliding off those pedals, resulting in a lot of painful moments involving the bike seat and my crotch area. Despite all of that, I could feel myself getting better. I subsequently broke out the clips, and all was well. And—I was hooked. There are always moments when I want to quit. At some point, during every single ride, I want to just stop. I think that there is no way I can make it to the top of the hill, that I’m simply just too tired. Then I get to the top, and the feeling of relief overpowers the longing to quit. Then there comes the moment when I realize that I am out in the woods while most people are still asleep, that it’s not even 9am and I’m already doing something that makes my entire day worthwhile, and that even if I’m not the best and the fastest, at least I’m always trying, and not giving up. I remember these things, and suddenly I have the energy to continue. It pushes me up the long hills, through the pain of all the falls I inevitably take. After only several chilly mornings on the bike, I was once again in love with a sport I had nearly forgotten. March 17. 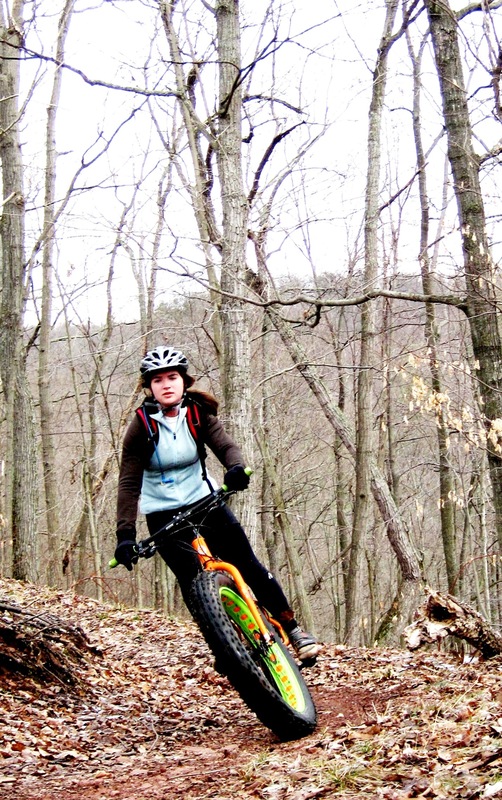 Allegrippis Trails, Raystown Lake, PA. Photo by Evan Gross. *Author’s Note: This should have been published sometime in early March, when I first wrote it. Better late than never. Previous PostPrevious To the woods. Next PostNext Wet, muddy, happy.